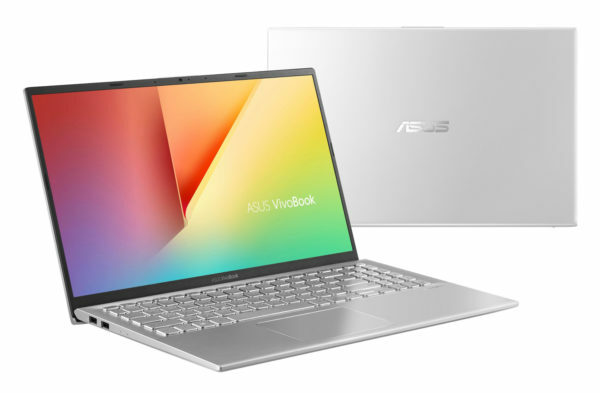 Its compact, angular and elegant size is what immediately seduces about the Asus VivoBook S512UA-EJ140T. Asus has equipped it with a borderless Full HD screen that will delight moviegoers and an office base that is fully capable of supporting productive use. The system is responsive thanks to the good amount of RAM and SSD storage, and the backlit keyboard will be invaluable for working in the dark. By cons, it will not expect anything from the small battery and we have already seen more end on a 15-inch ultrabook. 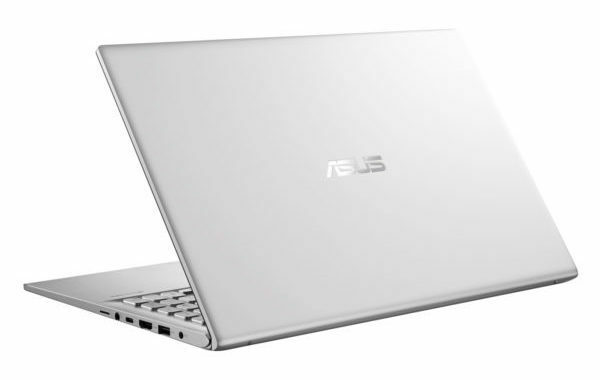 With its refined design and narrow screen borders “NanoEdge”, the Asus Vivobook S512UA-EJ140T does not lack charm. Its small weight of 1.6 kg and its compact size (357 x 226 mm) make him the perfect little companion for studious outings. Its silver metallic finish is embellished with no particular finish for a purest appearance, a mark of elegance and sobriety. 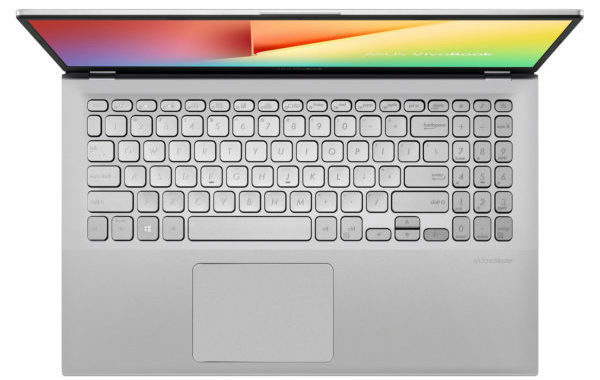 Note that Asus strengthens the back of the aluminum cover for more robustness and a numeric keypad is slid on the right side, a detail that is not one for those who regularly enter numbers. Also welcome to make typing easier in a dark environment, the backlightwhite of the keyboard is adjustable on three levels of intensities, a more significant. The screen also plays a decisive role in the aesthetics of the ultrabook and its refined NanoEdge contours will not only increase the feeling of immersion but also allow to slide a slab of 15 inches in a 14-inch chassis. It has a full HD resolution (1920 x 1080 px) that provides a healthy display density to modulate the display or view in the best conditions High Definition content. In addition, the antireflection treatment facilitates the viewing in strong ambient light and the viewing angles are stabilized despite the use of TN. Note that the screen is placed on ErgoLift hinges which will raise the keyboard base when opening the lid, a plus for comfort. Well distributed, connectivity brings together most of the interfaces currently expected at this level of range. There is an HDMI output, a microSD card reader and two Type-A USB ports, one of which is still limited by the 2.0 standard. A USB Type-C is also part of it as well as Wifi modules AC and Bluetooth 4.1. No fingerprint reader on the menu, however. The ultrabook is then characterized by its voluntary heart composed of a recent Quad Core i5-8250U and 8 GB of RAM . This duo is perfectly comfortable with office and multimedia tasks, including surfing the Internet, playing videos, working on Office or photo editing (Photoshop, Lightroom). It can also tackle other missions a little more demanding (Adobe Premiere) in reasonable proportions. Moreover, the RAM in a satisfactory quantity ensures a fluid environment in multitasking. Also useful for performance, storage combines a dedicated 256 GB SSD with a large hard drive (1 TB) . This duo joins forces to ensure a system of the most reactive – the operating system, programs and games are installed on the dedicated SSD – while adding a large storage space to archive your toy library. The gain provided by the SSD is visible compared to a machine with a hard disk alone, especially since it is overall quieter, more robust and more energy efficient than its partner. To end with a point that can be angry: autonomy does not follow at all the nomadic direction borrowed by this Asus VivoBook S512UA-EJ140T with just 4 to 5 hours Internet browsing with WiFi active. It is below the average of its category.